As you discovered in Chapter 6, views display a variety of information: tables with several fields of data, task bars, network diagram nodes, and so on. Microsoft has provided a plethora of views, meeting just about every information need. Nevertheless, you may want to create a variation on one of those views to look at information from a different perspective. 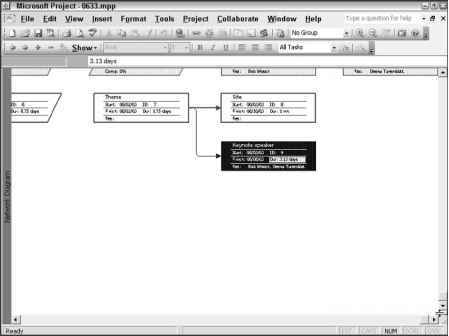 For example, you can create a second Network Diagram view in which you set the nodes to display a different set of information than the standard Network Diagram view. Then, rather than having to modify the nodes in the original Network Diagram view each time to see different information that you call on frequently, you can simply display the new view to use the alternative Network Diagram view. You can base an alternative view on any of the existing views and then change the information that Project displays by default to include only the information that you need. You can select a view from the View bar, or you can choose ViewOMore Views. Project gives you dozens of alternative views from which to select, as shown in Figure 7-8. When you create a new view, you can include it on the View bar or make it available in the More Views dialog box only. Figure 7-8: A wide selection of built-in views meets most informational needs. You can edit an existing view instead of creating a new view. 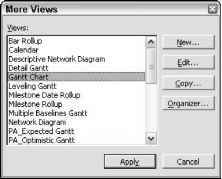 But, like the More Tables dialog box, the More Views dialog box does not have a View reset button; consequently, any changes that you make are permanent. As I previously suggested, make a copy of a view that you want to modify, rather than editing the original view. That way, the original views remain intact. 2. Click the New button in the More Views dialog box (shown in Figure 7-8). The Define New View dialog box appears, as shown in Figure 7-9. Figure 7-9: A simple choice awaits you in the Define New View dialog box: a single or combination view. Tip If you can, base your new view on a copy of an existing view — you'll have less to do to create the view. 3. Select the Single view option, and click OK. 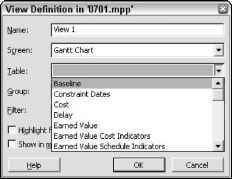 The View Definition dialog box opens, as shown in Figure 7-10. 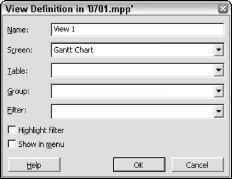 Figure 7-10: Use this dialog box to name and describe your new view. 4. Enter the name of the new view in the Name box. Choose a name that describes the information that you'll show in the view. 5. Select a current view on which to base the new view by clicking the arrow to open the Screen drop-down list. Then choose a view name. • If the screen that you chose in Step 5 gives you the option of selecting a table to include with it, select that table from the Table drop-down list shown in Figure 7-11. • If the screen that you chose in Step 5 does not give you this option, go to Step 7. Figure 7-11: All the built-in tables and new tables that you have created appear on this list. 7. Open the Filter list box to choose a filter to apply to the view. 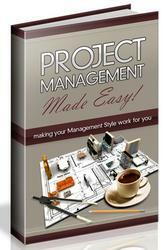 By default, Project applies the All Tasks filter; therefore, all tasks appear in the view. To apply a selective filter so that Project highlights only filtered tasks, select the Highlight filter check box at the bottom of the View Definition dialog box. Note You can set filters to remove tasks from the display that don't meet the filtering criteria, or you can set filters to simply highlight the tasks that meet the criteria. To reformat text that Project highlights as meeting filter criteria, choose Format1 Mext Styles. You read more about these techniques in the section "Filtering Views to Gain Perspective," later in this chapter. 8. Select the Show in menu check box to make the new view available as a selection in the View bar and on the View menu. If you don't check this box, you must display the view by selecting it from the More Views dialog box. 9. Click OK, and then click Apply in the More Views dialog box to save the new view and display it on-screen. You can manipulate views to see either a single or combination configuration. 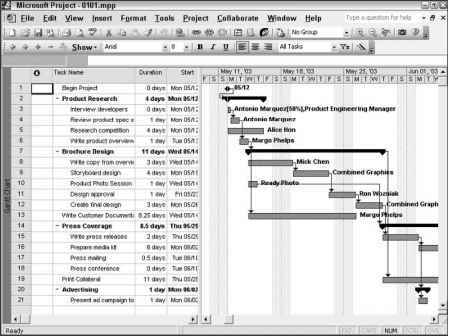 Combination views display the view that you've selected, as well as a second view that includes information about the selected task. Figure 7-12 shows the Network Diagram view with a combination of visual and textual information. Figure 7-12: A combination view displays information for selected tasks. You can display a combination in any view by moving your pointer to the split bar, shown in Figure 7-13, until the cursor becomes two horizontal lines with arrows; then double-click. You can also click and drag the split bar toward the top of your screen, or you can choose WindowOSplit. You can return to the simple Network Diagram view by double-clicking the split bar again. If you are displaying a combination view and you switch views, the new view also appears as a combination view. To display a new view and have it occupy the full screen, choose WindowORemove Split. You can always tell which portion of the split view you're in by the active view bar, a dark line that appears along the left edge of the view when you click the upper or lower view. Figure 7-13: When the mouse pointer appears in this shape, you can double-click to create a combination view. 1. Choose ViewOMore Views to display the More Views dialog box. 2. Click New to display the Define New View dialog box. 3. 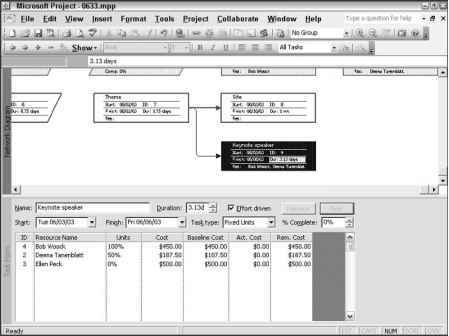 Choose the Combination view option to display the dialog box shown in Figure 7-14. Figure 7-14: In the combination view version of the View Definition dialog box, select the two views to place on-screen. 4. Name the view, and designate which view should appear at the top of the screen and which view should appear at the bottom. 5. To be able to display the view by choosing it from the View menu, select the Show in menu check box. 6. Click OK when you finish.